It is less than two weeks to His Royal DIAOness' 35th birthday and already, I have joined five Events on Facebook set up in honour of his big day. I do hope all of you will connect up and join in the fun! Some interesting posts I shared were about Jay's star sign and Chinese zodiac animal. Jay's star sign is Capricorn and as shown in the above link, he does have many of the qualities associated with this sign. I only disagree with the part about fashion....lol! Other than that, the descriptions are mostly spot-on! "1. A Capricorn man is known, for good reason, as the overachieving workaholic of the zodiac. 2. The Capricorn man treats love seriously. He is not a flirt, nor a player. He believes in true love and will wait patiently for it, and when finding it, will work hard to keep it. 3. The Capricorn man cherishes his close relationships and provides a logical resolve to any problem he's asked to become involved in. This man will never steer his friends wrong and will be there supporting his partner through life. 4. Capricorn men are not typically big fans of PDA (public displays of affection) and very much prefer to keep their personal lives on the private side. Any partner of his should know not to gossip about him, argue in public, or otherwise attract negative attention. 5. The Capricorn man will usually be a staunch, attractive individual in his own way, who walks with an air of confidence, even if he is not always feeling that way. He takes care of himself and can be a fan of diets, healthy eating, and exercise." Jay's Chinese zodiac animal is the horse. "A summary of prevalent symbol meanings for the horse: Power; Grace; Beauty; Nobility; Strength; Freedom. Horses are also extremely healthful, probably since they keep a positive outlook on life and simply because they’re athletic." 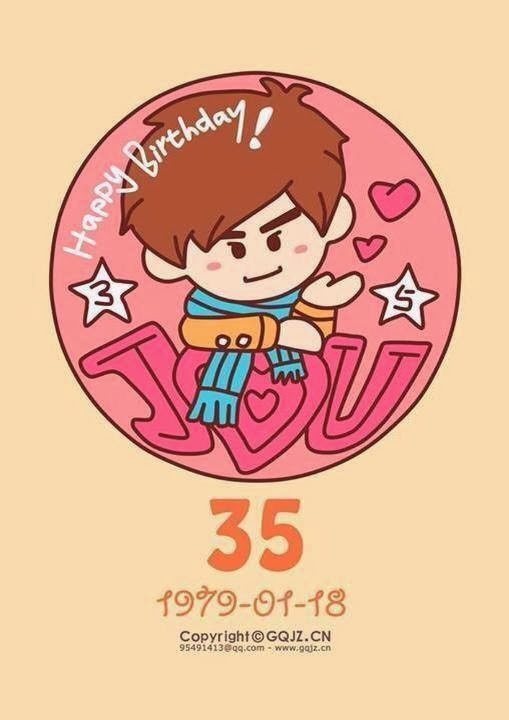 I also hope that all of Jay's fans will change their Profile pic to a Jay birthday pic on 18 January so that we can flood Facebook with the same images and show our solidarity as fans. So do come along for the ride as we head towards 18 January 2014 as I'm pretty sure Jay will see all the Facebook events and Pages or if not, his staff and friends will make sure he does! And yes, I am sending him a card/gift with my friend. Happy 35th birthday, Jay Chou! Happy Jay-ful New Year and The Brain!